With everything going on in the world at the moment, my mind’s been all over the place and I’ve been suffering from blog-writers block. Inspiration has not been forthcoming. The almost surreal, current world of politics may be stunting my writing growth, but it’s certainly keeping the press busy. Regardless of what recent events mean for us all in the long run, there can be no better time than now to be a journalist! 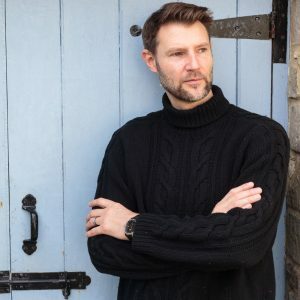 So, given that the journalistic pool of juicy news to wax lyrical about is overflowing, we at Du Maurier Watches are extremely grateful to a local journalist, the lovely Joanna Davis at the Dorset Echo, for taking the time to write a very nice piece about us. We are proud to be a Dorset business and love living in this area, so our inclusion in this week’s Dorset Echo weekend magazine is something we are very excited about. I’ll be honest with you, I do think Ned is slightly more photogenic than Donald Trump (do I have to insert the word ‘allegedly’ here?!) but the orange one is definitely grabbing more headlines right now, so we’re grateful for ours, thank you Joanna. Coincidentally, while we’re talking about headlines, yesterday Ned showed me an old Tatler front cover image he’d found. It’s of Gerald du Maurier (Daphne’s father) in a 1916 issue. Given that, 100 years later, we currently advertise regularly in 2016’s Tatler, this image really made me think. 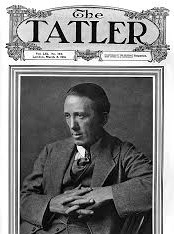 One hundred years ago Tatler published this issue with famous actor, Gerald du Maurier, as its cover star. This was against the backdrop of WW1, in the same year as the Battle of Verdun and the Battle of the Somme. With Remembrance Sunday only yesterday, these facts are swift to my fingertips, but a quick google to apprise myself of other world events in 1916 shows a vast historical landscape we can only now imagine. Here are a couple of 1916 headlines I found which make you think: Margaret Sanger opened the first birth control clinic in the US, and Jeanette Rankin was elected in Montana to become the first woman to serve in the US congress. I’ll leave those two snippets with you. So that puts current events into perspective somewhat, doesn’t it? I’m now slightly ashamed to have been caught moaning about world events giving me writer’s block. How very trite recent events seem now in light of the world our relatives lived in 100 years ago. It’s done the trick though & I’m all fired up for a few more blog posts and I’m still really chuffed we got a piece in the Echo in 2016!